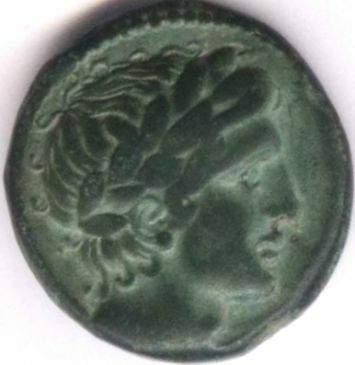 The images above picture a Fedeşti type coin issued by Histria (with a sensational green patina), struck betwix four and three centuries BC. In the village of Fedeşti from the county of Vaslui a hoard of about 300 bronze coins was discovered in 1976 comprising coins issued by the Greek city of Histria, all from the same type. The pictures above of an ancient Greek coin struck at Histria are present on Romanian coins through the kind contribution of Mr. Ion Şerban, collector of Pontic coins. Histria struck during the fifth century B.C. the first coins on Romanian territory: silver drachmae. 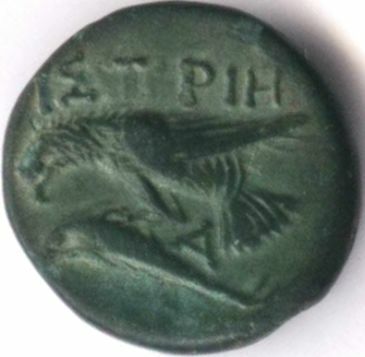 According to historian Nicolae Iorga, the dolphin clawing eagle ensign we see on the reverse - used like a coat of arms by Histria - was given to the Greek world by the city of Sinope (also a colony of Miletus). Olbia, Sinope of course and many other Greek colonies struck coins bearing this thalassic symbol.